Carmen Buitrago is a professional expert in the analysis of wines in Italy. San Remo, the winery of his family, produces the only singani from Chuquisaca that is exported to the United States and Australia. The only certified Bolivian sommelier at the international level owes the passion for the knowledge that the wines hold to a winery of more than 235 years of tradition located in Camargo, Chuquisaca. In 2009, Carmen Buitrago undertook a trip to Italy that became a change of profession and life. “I grew up in a family that has traditionally made wine and singani (…). In Italy I discovered the passion to learn about cultures through wine, I found it fascinating that wherever you go in Europe you can perceive history thanks to this drink”, recalls Buitrago, whose ancestors founded the San Remo Winery in the Valley of Los Cintis, according to records during the seventeenth century. 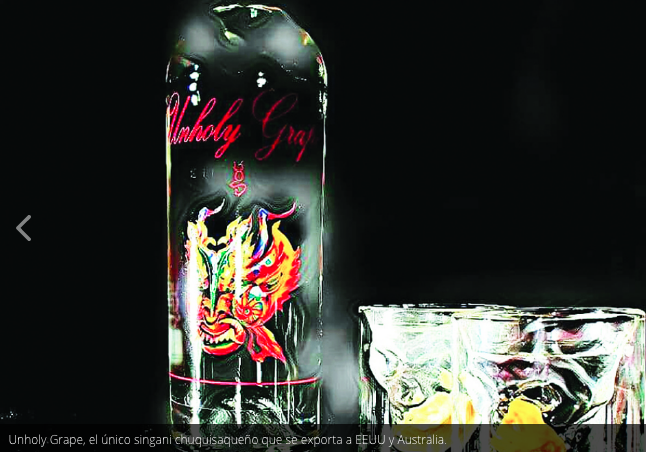 Today this brand produces the first singani from Chuquisaca that is exported to the United States called Unholy Grape, in Spanish profane grape. In 2009, during her vacations in the European country, she completed a diploma in Management in Medium Cellars. In Bologna she discovered that she enjoyed tasting a lot, recognizing the characteristics and qualities of the wine, its process and the memory it carries. 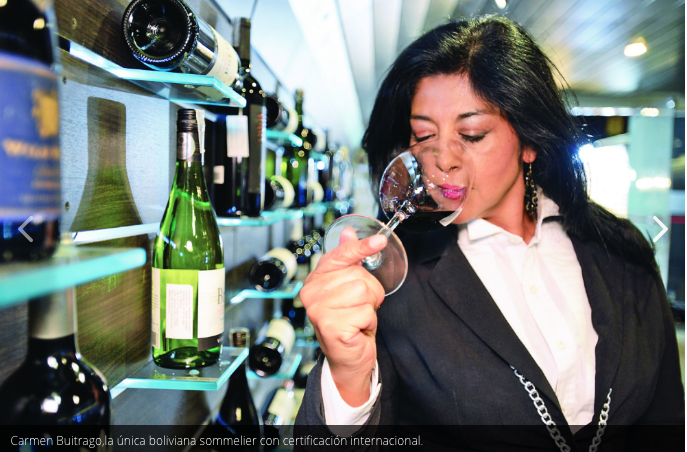 She left her job as head of Protocol in the Senate of Bolivia and registered to study at the Italian Federation of Sommeliers in Rome. She finished her degree in two and a half years and obtained international certification. “Being a sommelier is like being a critic,” says Buitrago. Is an expert, a wine analyst who takes into account all its characteristics whose final product is the drink that reaches the cup. Her career involved knowing the different types of wine in the world. This is complemented by the climatological phenomena of the areas in which the wineries are located, just to mention an example. “The objective of the sommelier is to transmit in an impartial way to the consumer if the wine meets the characteristics of quality and variety that the producer ensures,” she adds. Her mission in the tasting events is, in addition to broadening the panorama to drink connoisseurs, transmit the knowledge of certain wines. By tradition in Europe, a sommelier certified at a professional level is identified because he carries on his chest a small silver cup hanging, which is called collar sumiller, tastevin. Of course, Buitrago has hers. In 2011, she returned to Bolivia and during her stay became an external consultant for the boutique winery Casona de Molina, Camargo, which produces wines with that brand. Later, during a visit to Mexico, they invited her to work in an importer and distributor of European wines. In 2012, she returned to Italy to renew her credentials, was hired by the Italian winery Bortolomiol to open a market for her products in Mexico. Since then, she has been the ambassador of that brand for Mexico and Latin America and its emblem is a superior prosecco wine, a frothy and dry beverage that is made from the variety of glera grapes. 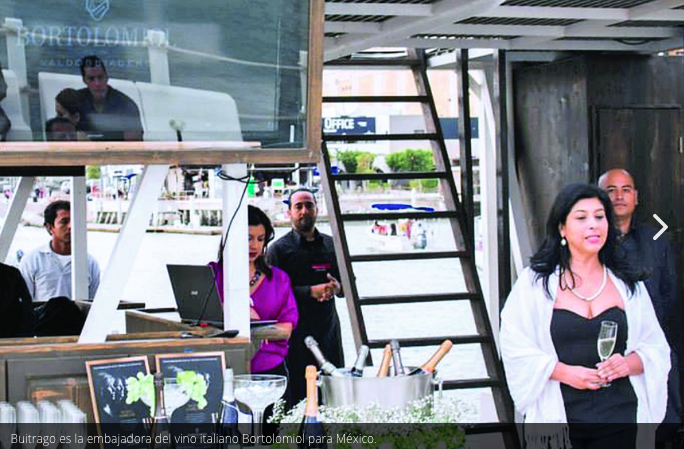 Today she represents the brand in private demonstrations for experts, events and trainings in the best hotels in Cancun and the Riviera Maya, among other destinations besides the United States, and since last year she also represents the Italian Coppi winery. Buitrago considers that this “boom” of Bolivian wine that follows a global trend is an opportunity to learn how to drink it. Know the varieties and their flavors, the harvest, the region, how the elaboration processes are carried out, and others. For the expert, the concept of singani Unholy Grape represents what is forbidden, an irresistible temptation before which inevitably you succumb trying it. Therefore, it has the mask of a devil in the bottle. This is the first year that this singani from Camargo is exported to the United States and so far they have sent 8,000 bottles. Likewise, another 2,000 were exported to Australia. “It has the primary aromas and a flavor that identifies the Moscatel variety of Alexandria and the region. The fruity and citrus aromas are very evident, it has an alcoholicity as it should be, but it is very delicate in the mouth. This is because of the water that is used to hydrate the singani with a very light PH,” says Buitrago. The sommelier suggests drinking it pure to appreciate the delicacy already described, whose minerality causes salivation. 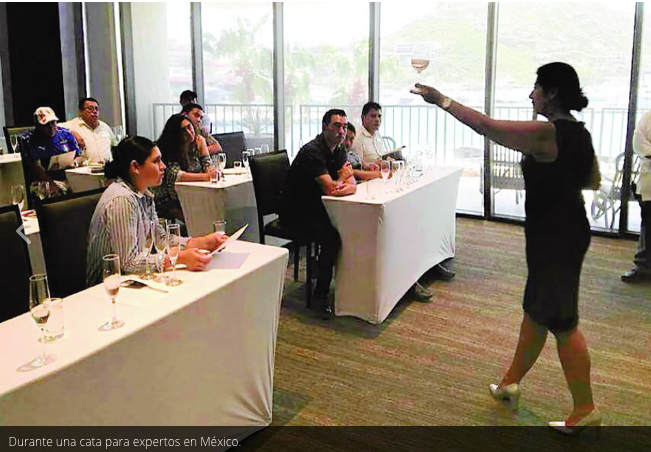 The effort of her family has aroused the interest of mixologists in Mexico, who already have creations with Holy Grape, probably the next step for this Bolivian spirit drink. The production, which has been taken up several years ago, did not set out to transcend borders only. San Remo has taken on the task of broadening the landscape of Singani abroad and getting those who drink it to know Camargo despite being hundreds of kilometers away. Bolivian Thoughts opinion: I welcome Carmen Buitrago to The Hall of Bolivian Fame! This entry was posted in Bolivia, Business and tagged Chuquisaca, competitiveness, singani, wine. Bookmark the permalink.